In the books I describe the old abandoned house that Jarrod loves so much as being surrounded by trees and having large flocks of small birds that fly through the air in perfect synchronicity. This was based on a real house I visited several times as a teenager. The birds are starlings and to see them flying this way in a video is special enough, but seeing it in person is truly magical. It’s one of my favorite memories. I’ve located a good video of what they look like while they’re flying. Check it out and see just how magical they are. Book 6 of the Unseen Things series, Division, is now available! 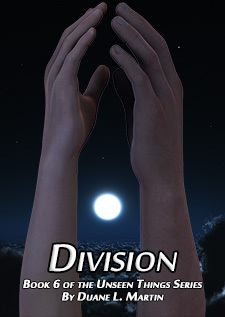 I am very happy to announce that Division, book six of the Unseen Things series is now published and available! Synopsis: When they received their injections of the original serum, they became immortal and their bodies gained the ability to regenerate, but now the backers have created a new version of the serum and with that serum comes a host of new strengths and abilities that they never even dreamed possible. It’s not just the new serum that’s changing things however. With marriages, new team members, a division of the group into two separate operations, the return of an old friend and a visit from two very unexpected guests, Division represents another great leap forward in the evolution of the Unseen Things universe. Initial work on Division has been completed! I’m very happy to announce that book 6 of the Unseen Things series, Division, has now been completed. It took me exactly eleven days to complete the main story, which came in at 93,439 words. That number will grow as the editing process progresses, so I won’t have a final word count until I’ve finished with the editing. I’m anticipating being able to publish the book early next week at some point. Once it’s published, it will be made available for sale on Amazon, through Smashwords and the sites it distributes to and here on the homepage as well, just like all the others. When I started writing Division, I started out just had I had when I started writing every other book in the series except for the first one. I picked up where the previous one left off and I went from there. Sometimes I had a general idea of what was coming next, while other times I would just start writing and let the writing itself take the story wherever it was going to go. Division has been a bit different in some ways however. First, I started the book three months after the previous one leaves off. This was necessary for an element of the story that was going to take quite some time to complete. Second, while the main idea behind Division was to split off a lot of the side characters to a new operation and house in Scotland, that won’t come until the end of the book. That means I had to fill the rest of the book, but with what? To be honest, I wasn’t really sure. That’s where the whole, “Just start writing and let the story take you wherever it’s going to go,” thing kicks in. In this case, it took me in a very different direction that I would have thought. Division has so far (I’m half way through chapter 10 as of right now) been more about the people, both involving their new abilities as well as dealing with some very personal issues with regard to love and relationships. There’s some dimension traveling and some fighting, but that all takes a back seat compared to those other elements. So how did this come about? To be honest, there were really two elements that caused this book to become what it has. The fact that the characters are now able to create mental links with one another, and also my decision to have Jan and Larry get married. Those two things combined have taken the book in a very personal direction that has been very difficult for me to write, not because of the writing itself, but because I myself became very emotional as I was writing various scenes. Chapter eight was especially difficult for me, as was chapter nine, simply because as I wrote it, I became a teary, sobbing mess. I’m kind of ashamed to admit that, but I’m really sentimental about love and loss, and those two chapters especially deal with those two things heavily. That’s not to say there isn’t any humor in this book, because just like the others, there’s plenty of humor scattered throughout, but even that becomes muted during the heavier, more emotional parts of the story. The book is progressing rather quickly and will likely remain a very personal book all the way through the end. The next book will see a return to the dimension traveling, exploration, discovery and humor that have marked the series up to this point. Anyway, that’s about it for now. While Division has some really awesome elements to it, the personal direction it’s taken has turned it into what is so far my favorite book of the series. I’ve really poured a lot of emotion into it, and I really hope that comes through in the writing. Just finished chapter 3 of Division. I’m really happy with how it’s coming out so far and I’m working diligently on it. I’m trying to pound through a chapter a day, which is generally somewhere between 5,400 and 6,000+ words. If I can keep up that pace, that means I can finish the book in a little over two more weeks. I’m not sure I’ll be able to write without interruption the entire time, but in any case, the work is progressing along nicely.